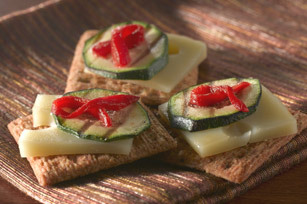 These appetizers get their Mediterranean flavour from grilled zucchini, roasted red peppers and TRISCUIT Roasted Tomato & Olive Oil Crackers. You can have a platter of these tasty appetizers ready in minutes, but you might want to make a double batch since they will disappear just as fast! Pairs well with a glass of Chianti. Substitute 1/2 cup chopped leftover cooked vegetables for the zucchini.